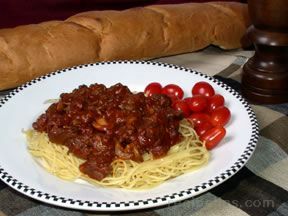 Combine spaghetti sauce mix, tomato sauce, water and salad oil in large frying pan. Heat to boiling and simmer 10-15 minutes. While sauce simmers, combine beef, onion, celery leaves, egg, cracker crumbs, and salt in large bowl. Blend lightly. Form meat mixture into 24 small balls; drop into hot sauce; simmer 45 minutes, stirring occasionally. 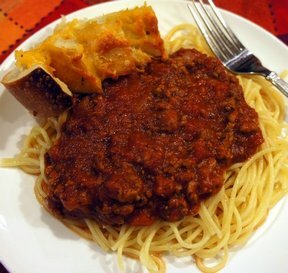 Cook spaghetti in large amount of boiling water; drain. 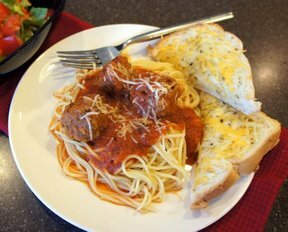 Spoon meatballs and sauce over spaghetti. Serve with parmesan cheese. "Your recipe looks wonderful, and years ago, when I was much younger I made my own sauce. I am now in my 80s, as is my husband, who became gluten sensitive/allergic, eight years ago. I became, somewhat lazy, thus the following changes. I use a gluten free pasta, gluten free bread crumbs in the meat balls, and use a ready made pasta sauce, adding more garlic, onion, and basil, to spice it up." "I loved this sauce! I changed it a bit and used a jar of spaghetti sauce, 1 can of tomato sauce and 1 cup water. It thinned out the sauce a little, which I liked. 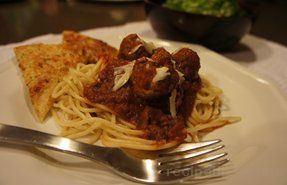 I had never cooked my meatballs in the sauce before and thought they were moist and tender, better than broil them before adding them to the sauce."